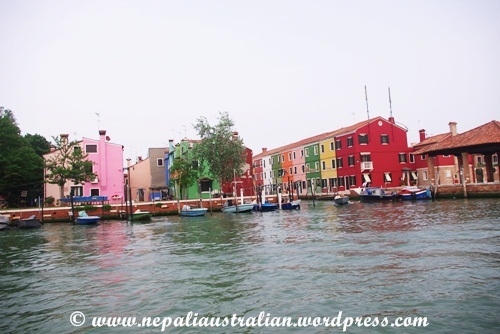 While in Venice, we took a boat trip to an island called Burano. It is an island famous for its lace and fisherman located in the Venetian Lagoon, in northern Italy. 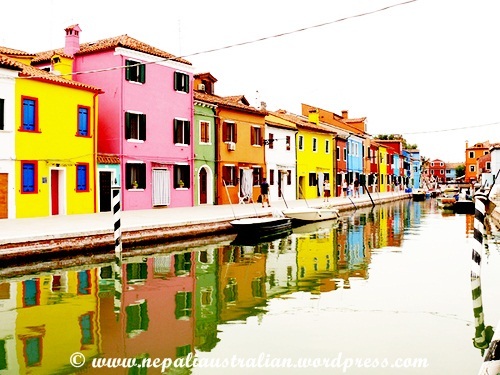 Burano is also known for its small, brightly-painted houses, popular with artists. The colours of the houses follow a specific system originating from the golden age of its development; if someone wishes to paint their home, one must send a request to the government, who will respond by making notice of the certain colours permitted for that lot. 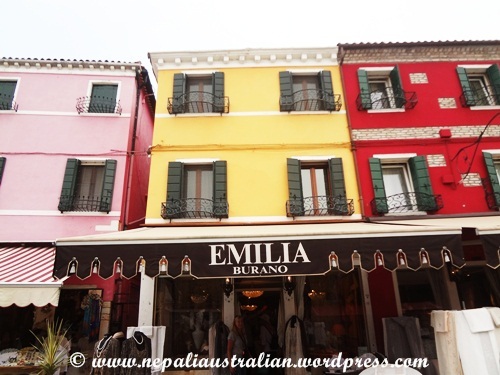 When we got off the island, we were taken to a lace shop called Emilia. We saw many lace works and a lady was working on a piece for us. It looks like a hard job but the end product is really pretty. 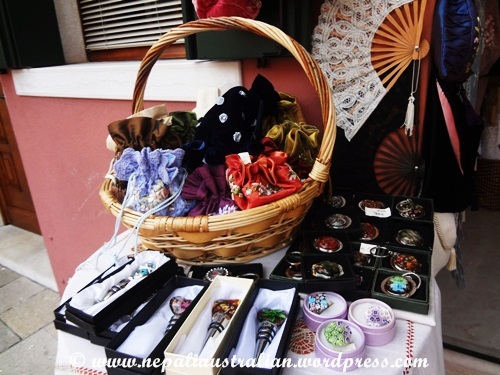 There are beautiful products which range from tablecloths and doilies to Venetian masks and babies’ booties. Back in the 16th century, the women of Burano started stitching lace. The work was extremely exacting—in fact, each woman specialized in a single stitch, and since there are seven stitches in total, each piece would have to be passed from woman to woman to finish. That’s why one handmade lace centrepiece for a tablecloth takes about a month to do! Because of that amount of work and how expensive it necessarily makes handmade lace, much of the lace you see being sold in Burano’s stores today is made by machine. 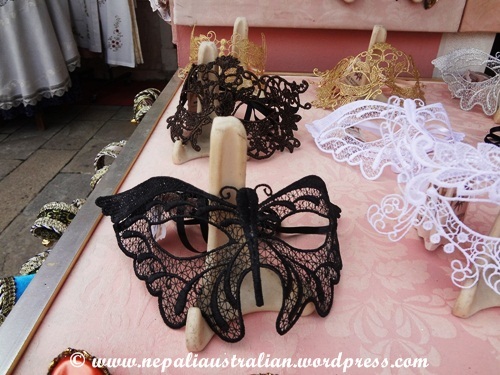 If you are really into laces there is a museum for lace and textiles called Museo del Merletto which is located on Burano’s main piazza of Baldassare Galuppi. The small two-story museum has impressive displays of historic and contemporary lace designs with some excellent examples of 16th and 17th-century lace, along with the beautiful, lace-trimmed gown worn by Queen Margherita, the Jackie Kennedy of late 19th-century. 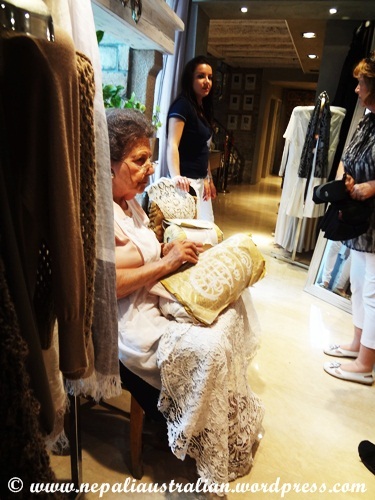 Once we finished with looking at lace work in the shop, we had time for ourselves to go around and explore the island. The island was just beautiful and bright with many colourful houses. In ancient times families used to paint their homes in bright colours to designate where their family’s quarters ended and a neighbour’s began, as well as to make their homes more visible from the sea. The tradition has continues till today. 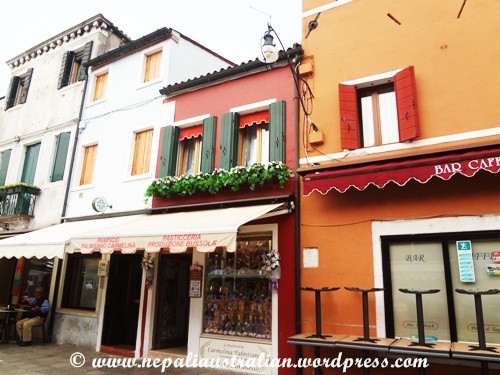 Walking around the village, we came across a church, some stands offering local souvenirs, Murano glass products and Venetian masks for a cheap price. Then we stopped over at a café to have a coffee and freshly baked biscuits. It was really a nice day trip in such a beautiful place. 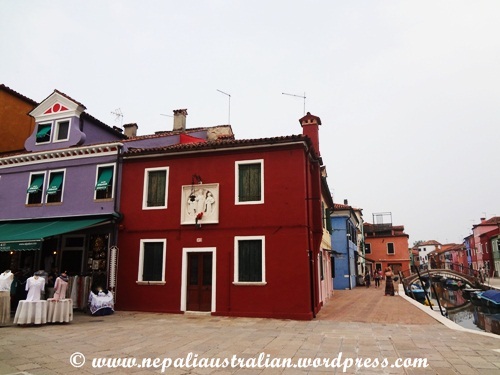 Can’t believe it….the same young lady and lady doing the lace work were still there when we visited Burano in April 2013. It was a lovely visit. The young lady was very nice. The colours, wow! And the lace… such care in making it by hand. Some of the pieces were really beautiful but it was bit pricey so I didn’t buy. Wow ! Why didn’t we go there? Your photos are awesome ! ! ! And that’s a great place. So colorful ! 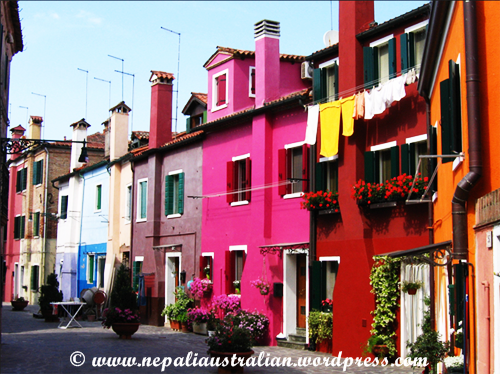 Burano is close to Venice and really small island.